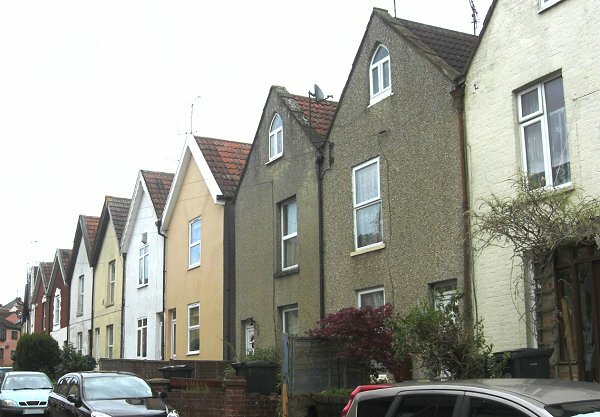 Clifton Terrace was the first major terrace of speculative housing built in Kiddle's Lane (today's Eastland Road). 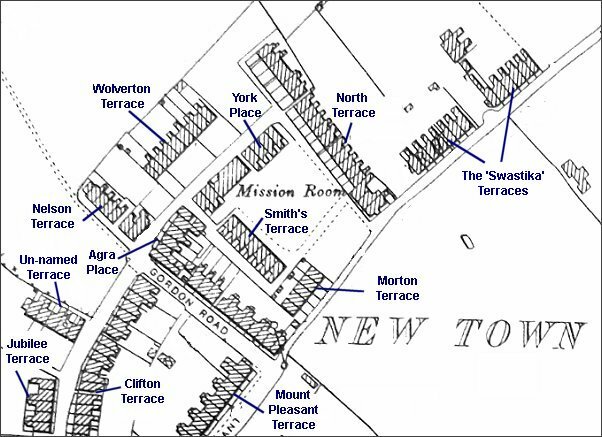 Built in 1870 (and still surviving), the terrace lined the eastern side of Kiddle's Lane from Mount Pleasant to Gordon Road as seen on the maps below. Above, this map based on the 1901 Ordnance Survey, shows the different speculative housing projects built in the early days of New Town. Most of Clifton Terrace is shown at bottom left. The map at left, based on the 1886 Ordnance Survey of Kiddle's Lane, shows that apart from a house (long since demolished) near the junction with Reckleford at the bottom of the map, and the short terrace of three cottages at right angles to Kiddle's Lane at top centre (still there with a couple of additional cottages), the only housing in Kiddle's Lane was Clifton Terrace. Clifton Terrace was built in 1870 and fills the eastern side of Kiddle's Lane from Mount Pleasant (running off the map at right centre) as far as Gordon Road at top right. At left the wavy lines represent Milford Brook which, at this time was still running above ground but is now culverted. It is possible to still hear the brook today through one of the road gullies near the entrance to the present day Kiddles housing development. Clifton Terrace, built in 1870. Photographed in 2013.